This tablescape was inspired by the centerpieces from my niece's wedding. I let the centerpiece dictate the colors in my place settings. •Wicker placemats from Pier 1. •Napkins from Urban Style Stitches on Etsy. I love these! They are reversible...betcha can't guess what's on the other side? •Red silverware was an engagement gift some 21 years ago. found at Walmart a few years back. •Red salad plates from Oneida Outlet. •Pumpkin bowls from Michaels, I believe. •Purple glasses from Pier 1. Oh yes, the centerpiece that started it all! I cannot take credit for the beautiful flowers. pumpkin baskets, but the rest is all her talent. My sister stopped over the day after the wedding. Very rich colors. I love the purple in there. The reversible napkins are a great idea. Gina, this is so rich with Fall colors! I adore the centerpiece! What time shall I be there? It's gorgeous! Lovely fall colors in your tables ape. Toes pumpkin bowls are so cute. Wow! That is darling centerpiece! Great job on the tablescape! Gorgeous table Gina. I love those colors together. Lovely centerpiece too. Incredibly well done, Gina!!!! You just let the centerpiece get your brain clickin' and you just ran with it! I love it when that happens!!! 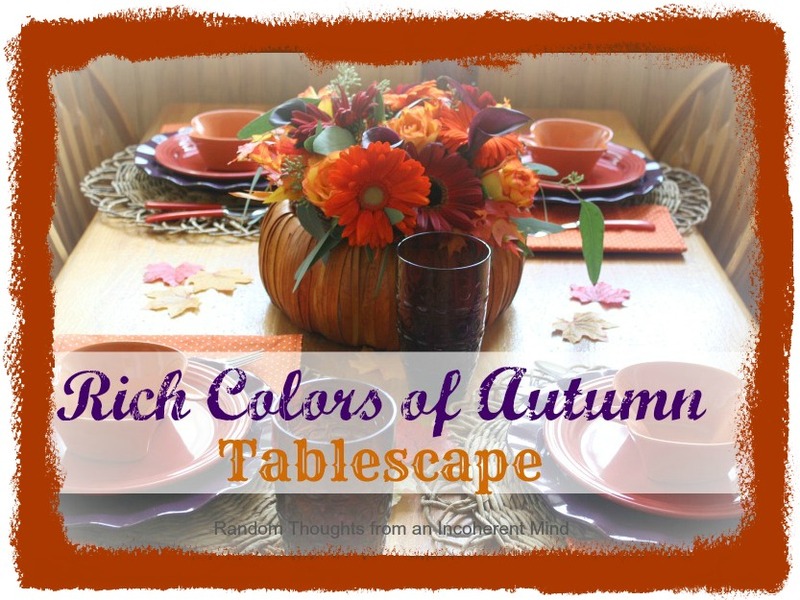 The florist did a wonderful job, and I'm so glad that it inspired you to do such a cool table with all these rich colors. Don't you wish fresh flowers could last for at least a month or so? Enjoy it!!! The colors are wonderful! Very pretty table! Beautiful! Your dishes go so well with the gorgeous centerpiece. I love it!!! Gina, this is so pretty! I love the purple mixed in...looks so vibrant and rich! Perfect, Gina! 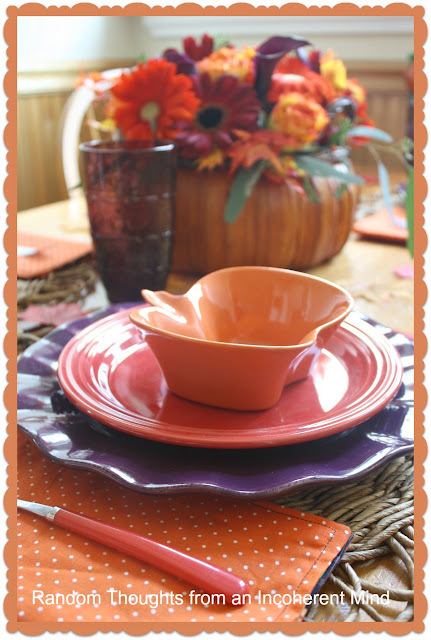 I love the colors of the dishes and so pretty with the centerpiece from the wedding. 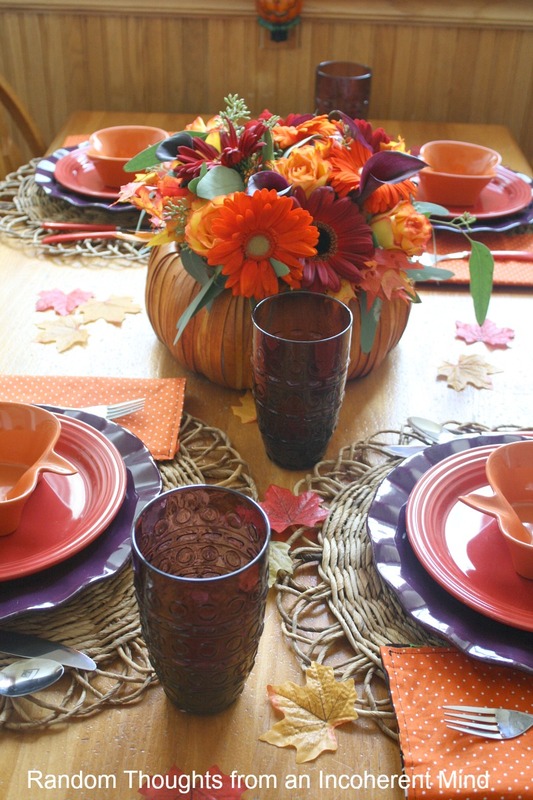 Wow, you sure did a great table using the colors in that gorgeous centerpiece, Gina! Hi Gina! Oh, your table looks wonderful! Oh, the pumpkin centerpiece is adorable! How nice you could have one! Very nicely done! That's neat that you incorporated a centerpiece from the wedding into a tablescape of your own! Dual purpose- love it! Very pretty - I love color! Gina your table is gorgeous! Isn't it amazing how an inspiration brings about a whole new creation! Your family must adore you and dinner time Gina. 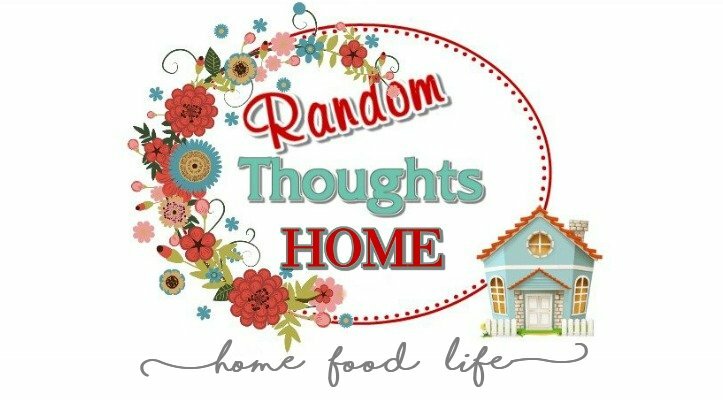 Not only because your cooking but because you make it fun and colorful too.LOVE this! The center piece is gorgeous! Love the lilies in it, and rich colors! Bet it was so pretty at the wedding! 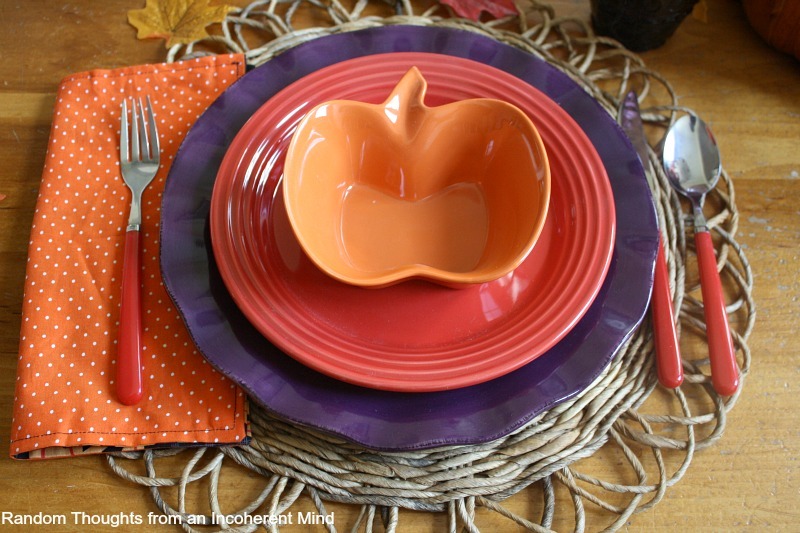 It sure looks great on your table with the pretty coordinating dishes! I love the purple and orange together! Your table is amazing. Love that centerpiece, too. Terrific as always Gina! Very inviting! 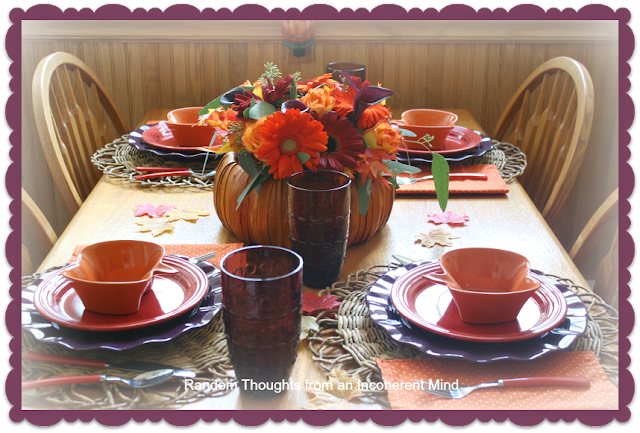 Wow, Gina- your tablescape is gorgeous! 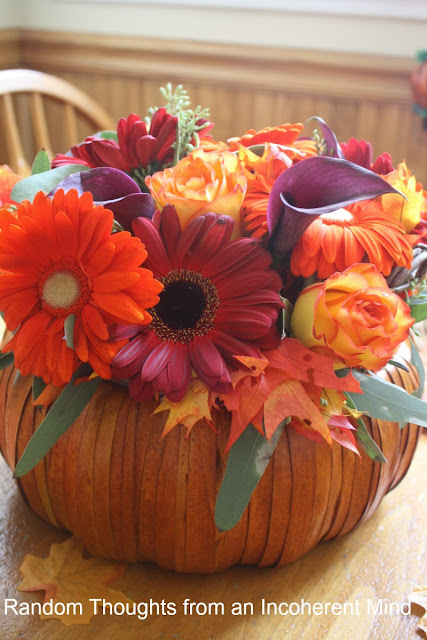 I love the pumpkin with luscious deep rich colours of fall flora in it- understandable why you used that as your inspiration! Who wouldn't want to sit at your table! I will be watching for the reveal of the other side! 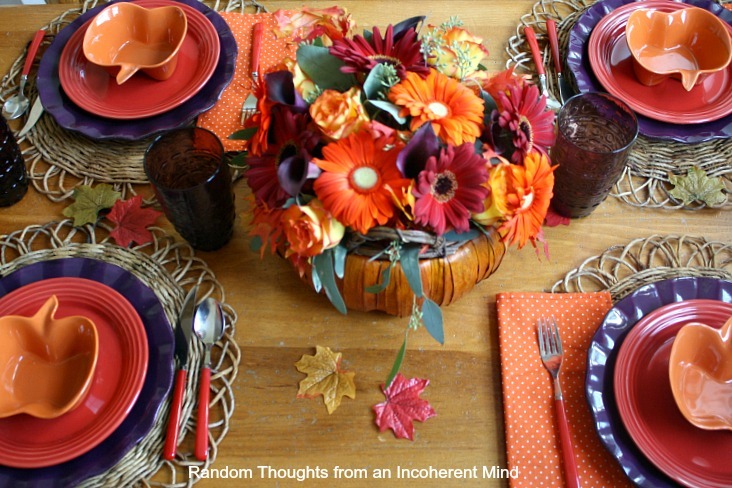 What a beautiful centerpiece Gina, and what a great idea using the pumpkin! Perfect for a fall wedding! Your tablescape looks great! This is so festive, Gina! Your table probably rivals the ones at the wedding! The mix of purple is really nice! You've nailed it once again. Beautiful and my favorite things are the pumpkin bowls! 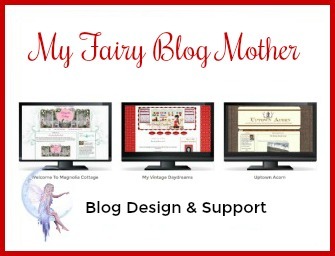 May I tell you your tablescape looks fabulous darling!!!!!! I love it. So where did you find those pumpkin bowls? I would love some. Oh, those purple plates..LOVE. We both need a big walk in dish pantry to store all of these dishes! Love those rich, warm colours. colours.Beautifully placed and very elegant table! Gorgeous tablescape! Gina, you always put together the most beautiful tables! I love the rich colors on this one! And the centerpiece is fabulous! Very, very pretty! gorgeous colors! the purple is a great twist! Oh my goodness! This is so beautiful!! LOVE these colors! Love all the beautiful colors. Autumn colors are the best. Great centerpiece and table! Love the colors. Let's see, on the reverse is a Turkey?